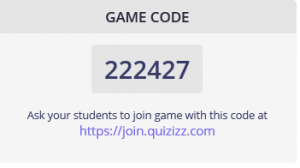 Math 7: HW: Review for your test by playing the following games at Quizizz. I have also attached the answers for the study guide. 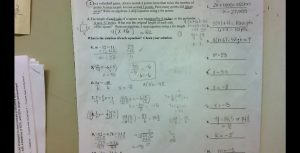 MATH 6: HW: p. 123, #7, 8, and 9. Read through your notes on unit conversions for the quiz tomorrow. You will be able to use your notes, but make sure you know about equivalent ratios! MATH 7: HW: Study Guide #4-10 and 13-18. Be reading over your notes on equations and inequalities. Test will be on Wednesday. MATH 6: HW: Page 123, #1-6. 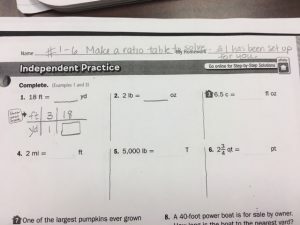 Make a ratio table to solve the problem. Use your MSG notes from today. I have attached a copy of the page for homework with one model drawn. MATH 7: HW: Monday and Tuesday POW problems. This will be due on Friday. Some of you are still struggling with 2 step equations. Please watch the following video. We will be starting inequalities tomorrow that will require the same basic steps in order to solve for the variable. MATH 6: Read through MSG notes and practice changing percents to decimal form. 3rd and 4th period need to complete percent word problems. 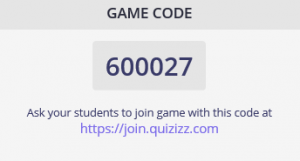 There was a typo on #6 so don’t worry if you get a number that has a repeating decimal. Your percent test will be open note tomorrow. MATH 7: Equation quiz moved to Wednesday. Read through MSG notes and practice solving equations from the handout you were given on Friday. We will use tomorrow as a practice day and answer questions you still have about solving equations. There were quite a few students out in 1st and 7th periods so it will give those people a chance to catch up. Make sure your OMG is up to date with notes we have taken in class. MATH 6: Read through MSG notes and prepare for test over percents on Tuesday. You need to know how to solve using a model and using math. MATH 7: We reviewed solving one step problems today. HW: Correct your fraction one step problems. Reduce fractions first because it will make it easier. Remember to multiply both sides by the inverse of the fraction. Complete the one-step addition and subtraction handout. Remember to show your work. 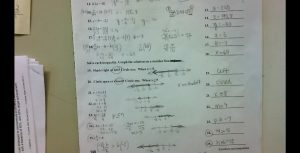 Math 6: HW: complete handout converting percent to decimal form and solving three percentage problem. You don’t have to model! Just do the math! Math 7: HW: Solving one-step fraction equations handout. Remember to reduce fractions first (if you can) then isolate the variable by multiplying by the inverse (reciprocal). Whatever you do to one side of the equal sign you must do to the other. Check your work. You can use a calculator but fractions can’t be changed to decimals. Answers must be in fraction form. Hope you are enjoying your afternoon at home. Math 6: HW: Model percentages for the following two problems: 1. What is 40% of 80? 2. What is 60% of 25? Then choose to do an equivalent ratio or math (decimal multiplication) to support your model. Use your MSG notes. Do your best. Math 7: HW: none. You can copy doodle note tomorrow. MATH 7: HW: Review Unit 2 OMG notes on expressions and operations with integers from Unit 1. We finish the test tomorrow. 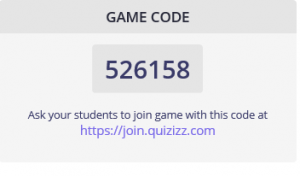 Look at Tuesday’s post and practice with Quizizz if you didn’t do so yesterday.